Join Rufus as he tries to puzzle his way out of the junkyard. 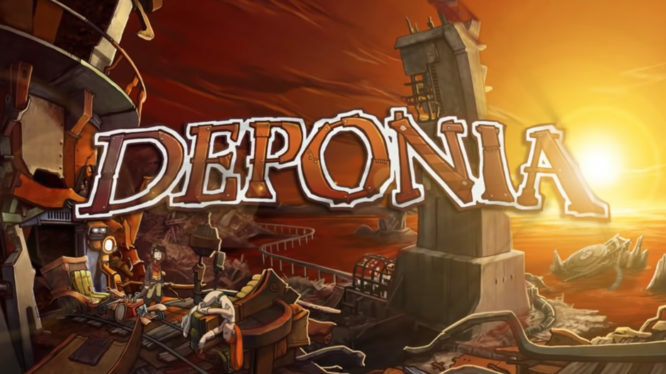 Daedalic Entertainment has announced that Deponia, the comic point-and-click adventure, will be hitting Nintendo Switch on March 27th 2019. Priced at $39.99, the game is said to be only one of the Deponia titles planned for Switch in future. Deponia is a hand-drawn point-and-click adventure game set on a planet that has become a dumping ground for the elite. Players take on the role of Rufus, a low-society inhabitant of Deponia, as he schemes to join the floating city above the clouds. When a wealthy lady called Goal falls from the sky, love-stuck Rufus soon hatches a fiendish scheme to join the world above – tangling himself up in something much bigger. Originally released in 2012, Deponia is the first of four titles in the Deponia series. Although Daedalic Entertainment hasn’t provided dates for future releases on Switch, they did confirm that the “other adventures of Rufus and Goal” would also be available “soon”. So fans of the series can expect to hear more information in the upcoming months. The first Deponia title is set to release for Nintendo Switch on March 27th and will be priced at $39.99 in North America. Prices for other regions are yet to be confirmed.